Chelsea boss Maurizio Sarri is set to be in charge for the Europa League game against Malmo on Thursday. The Italian's future has come under increasing scrutiny since a 6-0 defeat by Manchester City on 10 February. Matters were made worse by a home FA Cup loss to Manchester United on Monday when Chelsea fans turned on their 60-year-old head coach. After Thursday's Europa League second leg, Chelsea face Manchester City again, in the EFL Cup final on Sunday. It is understood recent results have caused disappointment within the club, but the manager and players are believed to be preparing for the next game. Owner Roman Abramovich has made 12 managerial changes he took over the club in 2003. After the cup final, Chelsea take on Tottenham in the Premier League on the following Wednesday as they attempt to bridge the gap to the top four. Chelsea are in sixth place in the table, one point behind fourth-placed Manchester United. Chelsea winger Pedro told the club website: "There is an important game in the Europa League for us and after the final against City. "The most important thing now is to stay calm, train really hard and recover our best football and our best feeling, because if not we are in trouble." Sarri is set to address the media again on Wednesday ahead of the last-32 tie against Malmo in which Chelsea hold a 2-1 lead. 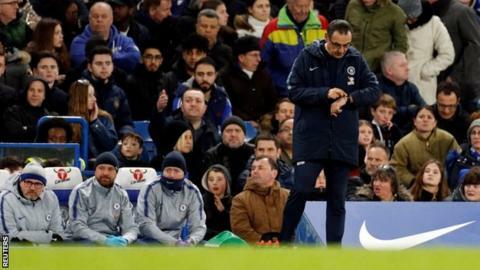 After the 2-0 defeat by Manchester United, former Chelsea striker Chris Sutton said: "He'll get the sack for numerous reasons - things he's said, that he can't motivate the players, his inability to be able to adapt and change." Former Napoli boss Sarri - who has never won a trophy as a manager - replaced fellow Italian Antonio Conte last summer.